Veteran Hanover coach Matt Heuer and his coaching staff knew the Wildcats had plenty of talent returning that practiced all last season against an experienced team that finished 12-1 and runners-up in 8-Man, Division I. For the 2015 season, Hanover installed junior Will Bruna, a charismatic leader, at quarterback. Bruna had played very well in a reserve role as a sophomore and helped lead Hanover to the Class 1A, Division I basketball crown. The Wildcats also returned several athletes from the 1A track title. Overall, Hanover returned zero offensive starters and two defensive starters, arguably the most inexperienced team in eight-man football. “We liked to have hoped that we were going to live up to what we saw potential-wise. At the same time, you never really know, because for a lot of these kids, it was their first true game experience,” he added. Hanover opened with a 48-22 victory against Axtell, a top-5 team in 8-Man II. The Wildcats then defeated quality Frankfort and Wakefield programs by at least 32 points, rolled over Blue Valley Randolph 58-0, and last week delivered a huge, district victory on the road against previously undefeated Rock Hills, 50-16. Hanover, unranked in the preseason, now sits No. 4 in the classification at 5-0 behind an explosive, pass-heavy look rarely seen among eight-man teams. The Wildcats have used last year’s state loss, an upset to Central Plains, and the limited experience as fuel for 2015. Hanover hosts Lincoln (3-2) on Friday. “Coming into this year, a lot of people didn’t think too much of us,” Heuer said. In recent history, very few eight-man squads have matched Hanover’s success with so few returning starters. According to Kansas Pregame archives, from 2011-14, 34 eight-man teams reported two or fewer returning starters on at least one side of the ball. Twenty-nine teams saw a drop in their win total, while one squad produced the same record and just four teams improved. The average decrease was -3.4 wins. Of the five eight-man teams this season with two or fewer starters on one side, three of them are already guaranteed a worse record than 2014. Of the 34, just three teams – 2012 Thunder Ridge (11-2, state runner-up), 2013 Hodgeman County (12-1, state runner-up), and 2014 Sharon Springs (11-1, sub-state) – won at least nine games. Those squads all featured run-heavy offenses. Hanover has transformed its offense from a squad that averaged 206 rushing and 165 passing yards a game in last season to 102 rushing and 254 passing this season. The Wildcats have averaged 53.2 points per game and allowed just 13.6. Of the 34 squads, the offensive leaders were South Haven (52.4, 8-2) and Uniontown (47 points, 6-3) in 2013, Thunder Ridge (46.3 points), and Hodgeman County and 2012 Lebo (5-3 record), both at 45.8 points per game. Wallace County had the best defense at 9.2 points allowed. Since 2007, the 2008 Caldwell team, with 248 passing yards a contest, has averaged the most passing yards by an eight-man program, according to MaxPreps archives. The eight-man state record is 290 per game by White City in 2000. Heuer said this year’s squad is built a “little differently” from previous teams. Hanover has several slot receivers and wideouts which do well in space. Hanover is probably not as big or powerful up front compared to past Wildcat squads but has great athleticism. Plus, Hanover knew it had a quarterback in Bruna to run the system. Hanover has often used a lot of the same plays but uses different sets. Hanover still goes two and three wide receivers, and Heuer said Hanover probably runs more four-wide than in prior seasons. Bruna was 10 of 14 passing for 192 yards with a five touchdowns and no interceptions as a sophomore. This fall, he has completed 82 of 113 passes for 1,239 yards with a 19 touchdowns and only two interceptions. In addition, he is Hanover’s top rusher with 51 carries for 277 yards. Senior Trey Lohse has 20 catches for 389 yards and six scores, while 6-foot-3 junior Adam Zarybnicky has 30 catches for 381 yards and five touchdowns. Senior Devin Jueneman, normally in the backfield, has 22 catches for 253 yards and four scores. Senior Matt White has collected 10 catches for 216 yards and four scores. Senior Paden Pralle, a key reserve in 2014, and junior Adam Fritschi start at guard. Junior Trevor Klipp starts at center. No starter is over 195 pounds. In addition, Pralle has already blocked a punt and recovered four fumbles, part of 17 turnovers from Hanover’s defense. Pralle, Lohse, Zarybnicky and White all won at least one gold medal at the state track meet last spring. The squad has four interceptions returned for scores, and Bruna averages 41 yards per punt. Hanover is already just one short of the state record for pick-sixes in a season. “We brought back a lot of athleticism,” Heuer said. In Class 6A, Lawrence Free State ended Shawnee Mission East’s 17-game winning streak with a 32-20 home victory. In 2-1A district play, Ellis defeated La Crosse, 20-18, at home, the Leopards’ first district defeat since Week 9 of the 2009 season. Both games were monumental for the winning programs, especially Ellis, which hadn’t defeated the Leopards since 2003 and earned a big victory in a close, four-team race in Class 2-1A, District 7. Both teams won with superior special teams and at least one statistical oddity. For Free State, the Firebirds ran the ball on all 24 plays in the second half. 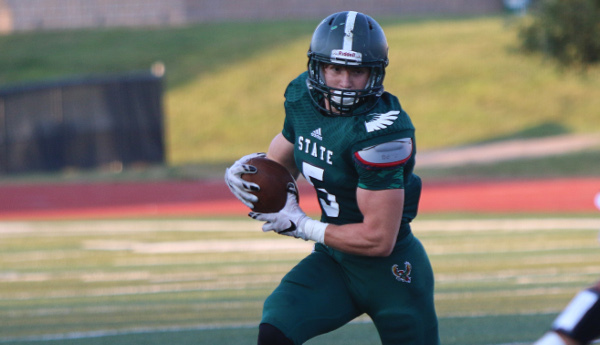 Free State finished with 58 carries for 344 yards and held a 388-387 yardage edge. Firebird freshman kicker Kameron Lake hit a 28-yard field goal as time expired in the first half for a 22-20 lead. Then, he added a 33-yard field goal for the games’ final points midway through the fourth quarter. Lake became the first kicker in Free State history to make two field goals in one game. He didn’t have a converted extra point in the first two contests, but then kicked a field goal and was 4 of 4 on extra points in Week 3 against Leavenworth. Free State also halted a key two-point conversion and had 54-yard punt downed inside SM East’s 5-yard line. Ellis finished minus-3 in turnover margin, lost the yardage battle 286-254, ran ten less plays than La Crosse (63-53), and finished with 16 penalties for 135 yards. La Crosse had just eight flags for 53 yards. It’s very rare for a team at any level to lose two of those categories and still win the game. “We missed opportunities,” La Crosse coach Jon Webster said. But Ellis junior Dalton Hensley went 2 of 3 on extra points, and La Crosse finished 0 of 3 on two-point conversions, including a key tackle-for-loss late from Railroader junior Clay Feik that would have tied the game at 20. Ellis tallied its final score when it took over at the Leopard 26-yard line following a short punt caused by pressure from senior Brendon Brenner. This week, La Crosse, 2-3 and under .500 for the first time in the seven-year Webster era, plays host to rival Plainville (1-4) and standout speedy junior quarterback Hayden Friend. Senior running back Garrett Myers broke the eight-man, single-game state record for touchdowns (12) and points (73) in Friday’s 83-44 win versus Pleasanton. Myers rushed 30 times for 420 yards and 11 rushing scores, returned an interception for a touchdown and kicked an extra point. The previous record was 11 scores held by Chase’s Jake Kizzar in 2009 and Fairfield’s Cannon Burns and Wakefield’s Zack Melius last season. Burns previously held the points record with 70. Doniphan West senior wide receiver Cooper Leach broke an 11-man record for single-game touchdown receptions with six in the Mustangs’ 55-20 win over Maranatha-Immaculata on Friday night. Leach finished with ten receptions for 187 yards, and his six touchdowns pushed his season total to 15. The previous single-game record was five touchdown receptions shared by Northern Heights’ players Hayden Parks (2008) and Nick Mendez (2010) as well as McLouth’s Nick McAferty (2012). Leach had tied the record of five touchdowns in a single game with a 16-catch, 261-yard, five-touchdown performance in a 35-34 win over Valley Heights earlier this season.